Bishop Andrew Thazhath was born at Pudukkad, Trichur on 13th December 1951. After having completed school education at Pudukkad and priestly formation at St. Mary’s Minor Seminary, Trichur and St. Joseph Pontifical Seminary, Aluva, he was ordained priest for the Eparchy of Trichur on 14th March 1977. He holds Bachelor’s Degree in Theology (B.D.) from Aluva and Doctor’s Degree in Eastern Canon Law (DOCL) form the Pontifical Oriental Institute, Rome. He served the Eparchy as Asst. Parish Priest, prefect of the Minor Seminary, Secretary, Vice-chancellor and Chancellor of the Eparchial Curia, Rector of Dolours Basilica and Adj. Judicial Vicar and Judge of the Eparchial Tribunal. 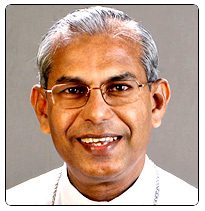 He was nominated the Auxiliary Bishop of the Archeparchy of Trichur and the Titular Bishop of Aptuca on 19 March 2004 when he was serving as the president of the Syro-Malabar Major Archiepiscopal Ordinary Tribunal of Ernakulam – Angamaly, the Syncellus of the Archeparchy, the Working Chairman and Managing Director of Jeevan Telecasting Corporation and the President of the Oriental Canon Law Society of India. He was ordained Bishop by H. G. Mar Jacob Thoomkuzhy on the 01st of May 2004 at Lourde’s Metropolitan Cathedral Trichur. His Motto is “ To be with Him and to be sent forth”.